Yellow tea – huang ya – is arguably the style of tea manufacture most recently ‘discovered’ by tea enthusiasts in the West, although it has been known in China since the days of the Tang dynasty (617-907 AD). Yellow tea is sometimes considered to be a variation of green tea, but it is indeed its own class of tea. Both loose-leaf and bud-only version of yellow tea are made, but the bud-pluck teas are the most treasured. Tea Trekker has been enthusiastic about yellow tea since we visited a small tea factory that specializes in yellow tea manufacture. That was in the mid-2000’s, in the vicinity of Mengding Mountain in Sichuan Province (see image of Bob examining a tray of partially-made tea on its way to ‘rest’) and we have been enthralled with it ever since. We recommend that every tea lover try yellow tea when the opportunity presents itself. 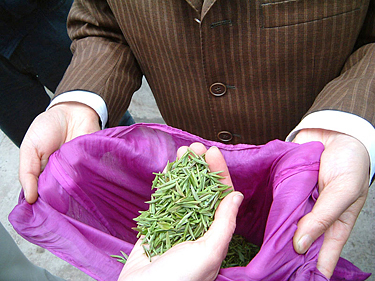 In yellow tea processing, after the leaf has undergone its initial firing this early spring bud-only pluck or fine mao feng pluck (a bud-and-two-leaves) receives a ‘smothering’ step in a unique process known in Chinese as ‘men huan’. During men huan the heated, softened leaf is removed from the tea firing pan, covered with a cloth, and allowed to ‘rest’ for a few hours or as long as a day. This smothering step may be repeated several times over several days, as determined by the tea master making the tea. In this step (which is not a part of green tea manufacture) men huan encourages the softened leaf to reabsorb its own aromatics. The results of this step will be expressed later as additional sweetness in the taste of the finished tea. This supplementary processing step is costly, so it is usually reserved for select early spring plucks, and is only manufactured today in a few specialty tea-making areas. The nickname ‘Snow Buds‘ refers to the fact that in most years the first harvest of this bud-only pluck occurs before the final snowfall of the year, and the buds are often picked while there is still a dusting of snow on the tips of the branches where these buds emerge. Sure enough, one morning on Mengding Shan we needed to wear cramp-ons because it was so very snowy and icy on the steep paths leading to the tea gardens that we were visiting.